The new game focuses around a Pokemon usually seen as one of the weakest. 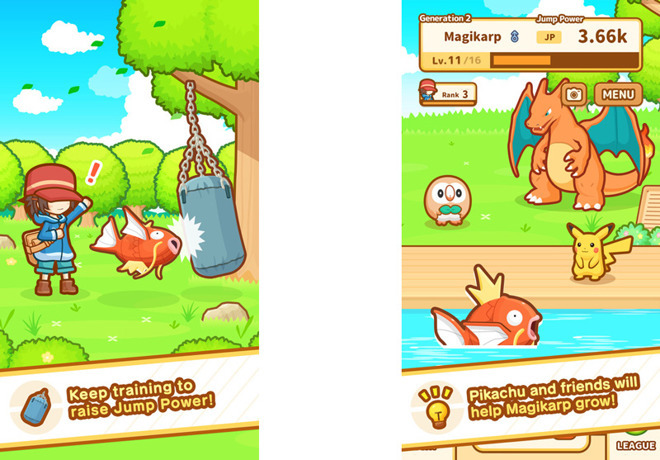 Players feed and train generations of Magikarps, looking to increase their jumping power for league battles. Rank increases allow food and training upgrades to be bought using coins, which are awarded through actions like battle victories. Another currency, diamonds, must be acquired using real money, but can provide a shortcut to upgrades. Magikarp Jump is a free download for devices running iOS 8 or later, though diamond bundles can cost anywhere from 99 cents to $34.99. Even if its popularity has faded somewhat, Pokemon Go was runaway hit in 2016. In early weeks people could sometimes be seen gathering in crowds to chase Pokemon in the augmented reality game, and businesses were eager to become in-game Pokestops or gyms. Sprint and Starbucks signed a deal with developer Niantic to make their outlets in-game locations.